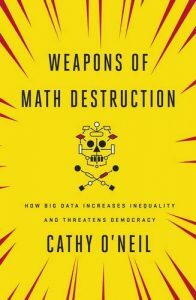 A polemic against the misuse of big data models by a reformed hedge fund quant – the book’s subtitle, ‘how big data increases inequality and threatens democracy’, is a pretty good indicator of what is to come. Using examples from policing to insurance and teacher evaluation, she shows that the underlying models often encode and reinforce prejudices, rather than being the embodiment of objectivity often claimed for them. It’s very US focused, both in its examples and in its style (a half way decent copy editor could easily make it a third shorter), but it’s a good, simple and readable introduction to some important issues.